It was the biggest bookstore in the world. Or purported to be. It was claimed two million new and used book filled the arcade shelves, in a multi story reading room and shop, alongside an art gallery, a menagerie, a fernery, curios, knick knacks, music boxes and wind up toys of all descriptions. It is one of the Lost Treasures of Melbourne. not many pictures remain of the shopfront. Edward Cole was born in Kent, England, in 1832. His father died when he was young and Cole left home when he was 18, heading to London to seek his fortune. Finding opportunity in London limited, he drifted to South Africa, where he worked as a farmer near Cape Town. The discovery of gold lured lured him to Melbourne, where he arrived in 1852. Cole worked on mines near Bathurst, but after a short stint decided that he was not suited to prospecting. Over the next few years, Cole would turn his hand to a number of things to make ends meet; selling refreshments to miners, land speculation in Castlemaine, even selling seeds he'd collected up country to the Royal Botanical Gardens. The early 1860's found this restless man back in Melbourne, running a pie stand on Russell Street. E.W. Cole in his booklined office. Although of limited education, Cole had always had a fascination with knowledge and learning, and was an avid reader. In 1865 he turned to yet another new venture, this time opening a second hand bookstore in Melbourne's Eastern Markets. Whether it was his enthusiasm for books, or just luck and good timing, Cole finally prospered in this profession. 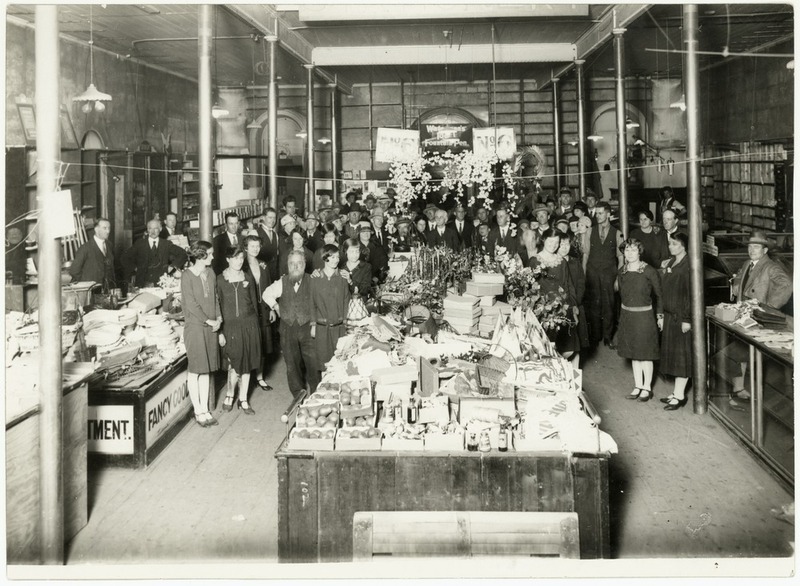 Within a few years, Cole was able to take over the whole Eastern Market, subletting the stalls out to other proprietors and making himself wealthy in the process. 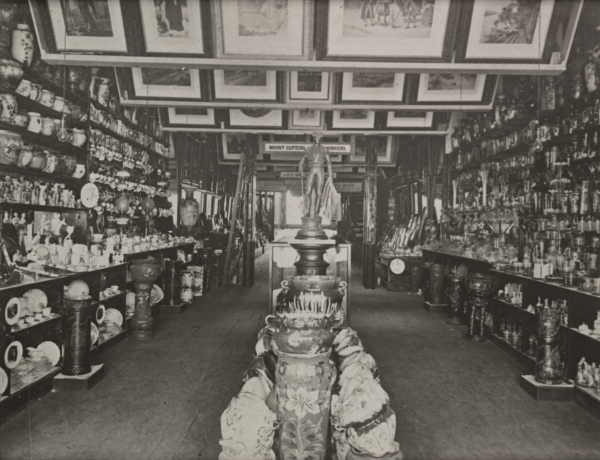 On the back of this success, Cole looked to expand and in 1873 he leased a shop on Bourke Street. 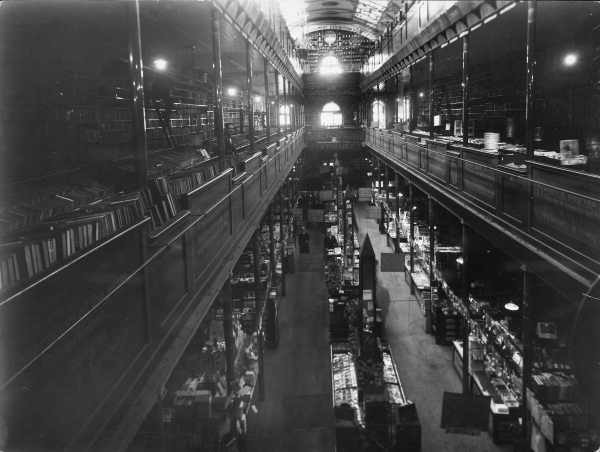 The new shop was initially advertised as not only a bookstore but also, 'The prettiest sight in Melbourne.' The interior of the new premises was decorated with mirrors and brass fixtures and the staff were dressed in bright scarlet jackets. A pianist was hired to play music each afternoon. The new Bourke Street store was a great success and was so popular that the shop it was based in was soon not big enough to handle the customer traffic. In 1883 Cole took over a much larger building in central Bourke Street, a former Spanish restaurant, for his book business to expand into. This building had two levels and Cole had the interior gutted, so that the upper level would look down into the ground floor below, creating an enormous open space. The open plan design of the book arcade in 1883. He transferred his ideas from his original Bourke Street shop - elaborate presentation, bright colours, live music - only on a much grander scale. The new store opened to such acclaim that police were required to handle the crowds. This shop, now called 'Cole's Book Arcade,' was an immediate success and grew immensely in popularity in a short time. 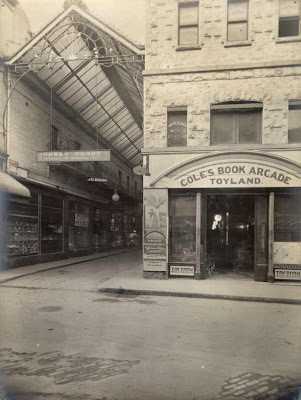 Always looking to expand, by 1896 Cole had taken over the building behind his shop and extended his book arcade through to Little Collins Street. By 1900 he had taken over the shops to the rear of that, so that his premises extended all the way from Bourke to Collins Street. He added a stone bridge over Little Collins Street, so that his customers would not have to bother with crossing the road if they were walking through, and the stretch from Little Collins to Collins was given a glass roof and filled with toys, an art gallery and a professional printing shop. 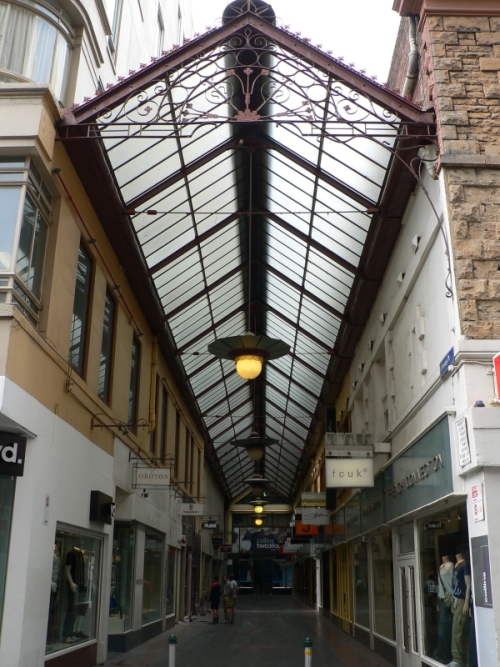 'Toyland' to the right and the glass roofed arcade to the left. Though the arcade was now in it's final form, Cole continued to add to it's interior. A clockwork gadget was added to the entrance, where two mechanical boys wound a handle that then displayed different upbeat slogans ('READ!' 'EAT WELL') A garden of exotic plants was added, and caged monkeys added to that. An arcade of funny mirrors was added for children. A different band was hired to play each afternoon. 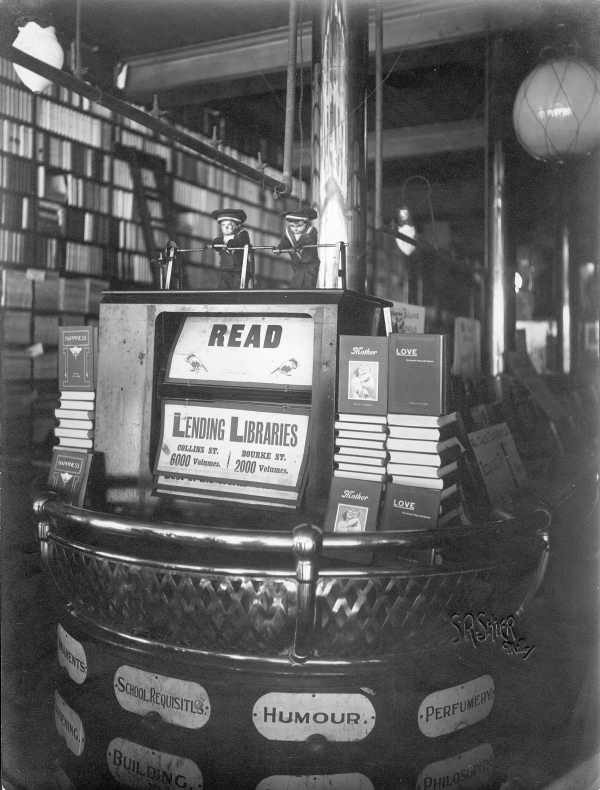 Armchairs and sofas were added to the ground floor of the book arcade and signs told customers that they could sit and read as long as they liked, without having to purchase anything. And stuffed into every corner, into every available space, were wind up toys and music boxes and comical pictures and anything else that Cole felt was amusing or interesting. The arcade was not only profitable, but engendered enormous goodwill from the city and was one of it's most popular attractions. egg when a coin was inserted into it's back. 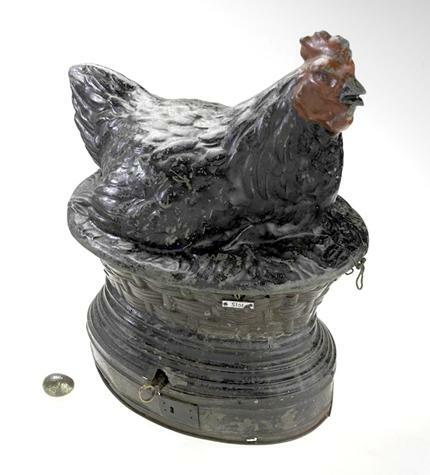 It now resides at the Melbourne Museum. working on display at the Melbourne museum. 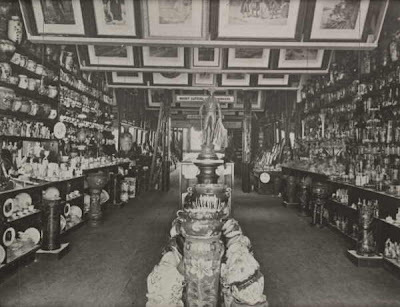 Picture gallery and curiosity shop. In 1911, Cole's wife Eliza passed away and Cole, now in his seventies, moved into semi retirement in Essendon. He spent his last few years overseeing his beloved arcade from a distance, and writing a variety of pamphlets, on topics both serious and trivial. He passed away in 1918. The ownership of the arcade then moved to a trust of his business associates. The business had been enormously profitable during Cole's lifetime, but there was disagreement among the trust members about how the business was now to be run. After 40 years of success, and only six years after Cole's death, by 1924 the arcade was running at a loss. Operations at the arcade were scaled down, and ancillary parts of the business were sold off. But the slide continued. After several years of losing money, the management trust decided to cut their losses. In 1929 the arcade was closed, an enormous crowd turning out for the last day. Australian test cricketer Chuck Fleetwood-Smith was the last customer. Book arcade staff at close of business on the last day. Note the empty shelves around them. 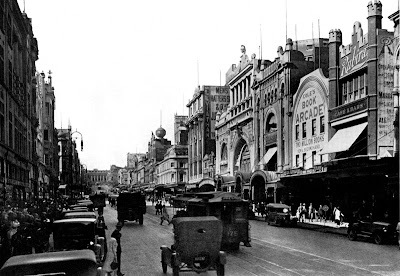 The Bourke Street property was auctioned and bought by G.J Coles and Co. (no relation) for ₤200 000, and was subsequently demolished and rebuilt as a department store. The same site on Bourke Street today is occupied by David Jones. The glass topped arcade through to Collins Street was also sold but preserved. Today it is home to upmarket shops and cafes. is now home to upmarket fashion. Thanks for that ! How I would have liked to visit it. It would have been amazing. Such a shame, there's really nothing like this anymore. (Rewritten from the removed post.) There's some confusion with the Allans Music Store next door which seems to have been called 152-158 since 1939 or earlier. How about Melbourne restores the facade? I expect paint supplies and painters would compete for the honour (& publicity) of freely enabling this! The building I'm wrote about above is apparently 160 and Coles' store was definitely 158, but that was in 1873. On the other hand this building seems too small. Perhaps EW's Rainbowed Book-Store was next-door and inspired the sun facade? Looking from other angles it seems the letters do spell "SHOES". If you click on the Streetview image you can look around inside the "White Tomato" store, which has something like a skylight but you can't see most of the ceiling. Turn around 180 degrees and you can see an unusually painted tram. According to http://www.onmydoorstep.com.au/heritage-listing/9432/160-162-bourke-street number 160 was originally designed as a church. Sun worshippers? 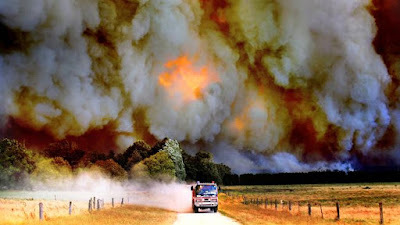 The photos of the "Toyland" part of E.W. 's empire & the upmarket fashion store in the building now(? ), were taken from Little Collins st.
160-162 Bourke St, (currently White Tomato) is in good condition inside, there is no first floor but the walls show a clear division. The outside of 160-162 is in relatively poor state, thick layers are flaking off the arc, possibly some kind of render?